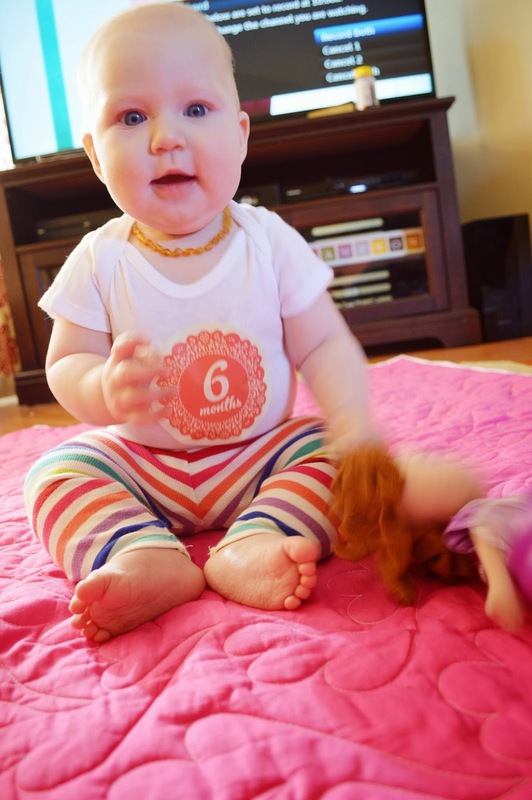 Miss Finley is SIX MONTHS OLD! It seems as though I was just giving birth, and here we are- halfway to one year!! At her last appointment a few weeks ago, she weighed 17 pounds, 12 ounces!!! She is wearing 6-12 and 9 month clothing!! She has recently started sitting up on her own...sometimes only briefly but getting better and better. She has also been working at getting herself into crawling position. She can get up to her knees, but only briefly for the moment...but that doesn't keep her from getting around- she rolls ALL over the place! Still no teeth, but working hard on them. Her favorite toys at the moment are her Sophia the First and Cinderella dolls. She is VERY drawn to Sophia the First...so cute to watch her get excited when she sees toys with her on them! She has begun reaching for mommy to pick her up at times...and loves grabbing faces- particularly big brother! Big brother is her favorite person. She still hates the car seat. She's starting to dislike anything that keeps her stationary- bouncers, jumper, etc. She'd much rather be on the floor to move...or carried by mommy! Finley sleeps pretty well at night but isn't much of a napper...unless being held! She's still a pretty quiet, quite content baby! 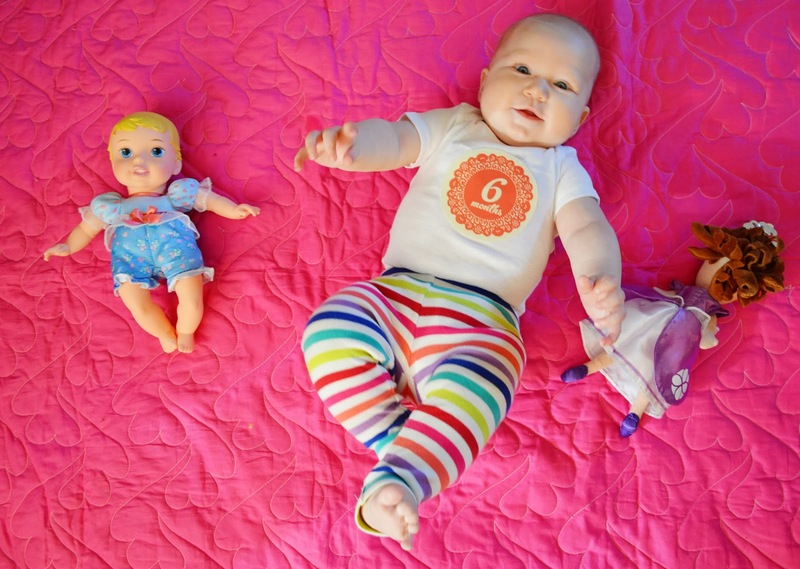 Overall, Finley is wonderful, we could not ask for a sweeter baby! We are still having so much fun watching her learn and discover new things! My favorite thing is watching the relationship develop between her and Shaun. They absolutely adore one another and it's so amazing to watch! What?!?!? She's already six months old. Time definitely flies.